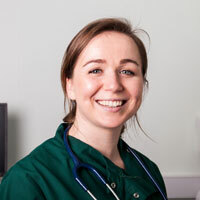 Emma joined Abbey in September 2017. She qualified from the University of Liverpool with commendation before moving back home to the North East. She likes all aspects of small animal practice but particularly enjoys surgery. In her spare time she enjoys cooking and attending gym classes. She has a rescue cat called topsy and a hamster called paddy.